If Beijing wanted to, it could probably develop a carrier-based equivalent to the J-16D. The J-15 Flying Shark fighters on China’s two Type 001 carriers also share common heritage in the Flanker family of aircraft, and pursuing a similar upgrade of the two-seat J-15SD seems plausible. However, one limitation would be the lower payload that the J-15s can carry, due to the maximum takeoff weight limitations imposed by the Chinese carriers’ ski-jump-style decks. In any case, it is not even clear to what extent the J-16D will be adopted. The United States Navy’s EA-18G Growler electronic attack fighters are one of a small number of military aircraft types dedicated to the task of jamming—and potentially destroying—hostile radars that could guide deadly surface-to-air missiles against friendly aircraft. This mission is known as Suppression of Enemy Air Defenses (SEAD). Basically, if a modern air force wants to attack an adversary with significant antiaircraft defenses, it needs an effective SEAD game to avoid insupportable losses. The Growler is derived from the F-18 Super Hornet fighter, and is faster, more maneuverable, and more heavily armed than preceding aerial jamming platforms based on transport and attack planes. This allows the Growlers to contribute additional firepower to strike missions, keep up with fighter planes they are escorting, and potentially approach a bit closer to hostile air defenses. China’s aviation engineers have never been too proud to copy a good idea from abroad, usually modified with “Chinese characteristics.” Perhaps it is not surprising that they appear to have devised a Growler of their own. The aircraft in question is a variant of the two-seat J-16 Red Eagle strike plane—itself a Chinese copy of the Russian Sukhoi Su-30MKK Flanker. The two-seat Red Eagle is roughly comparable to the American F-15E, and improves upon the Russian original with new avionics including an Active Electronically Scanned Array radar (AESA), the current state of the art in fighter-based radar technology. While China has had major problems developing reliable high-performance jet engines, it’s more successful at producing advanced electronics, perhaps due to crossover with its civilian electronic sector. The J-16D variant—the “D” in the designation comes from the Chinese word for “electronic,” diànzǐ—made its first flight on December 18, 2015. Photos were released to the public three days later. Let’s go over the admittedly short list of what the photo tells us. The J-16D has had its thirty-millimeter cannon and infrared sensor removed; this is not a plane intended to get into short-range dogfights! Instead, there are several new antennas and conformal electronic-warfare arrays along the fuselage. The J-16D’s nose radome is reshaped, possibly to accommodate a more advanced AESA radar. Most importantly, new electronic-warfare pods are mounted on the wingtips that resemble the American ALQ-218 electronic support measure pods on the wingtips of the EA-18G Growler. These are electromagnetic sensors that can analyze radar frequencies and help determine the position of radar-transmitting devices—data that would be highly useful both for jamming radars and for targeting them for destruction. That’s all that’s known for sure—the PLAAF, after all, is not in the habit of giving detailed briefings about its latest fighters. Let’s move on now to the realm of plausible speculation. If the J-16D’s airframe has integrated hardware to make jamming and anti-radar missiles more effective, it probably is designed to use jammers and anti-radar missiles. Most likely, it would carry two to three jamming pods the under the wings and fuselage, each optimized versus different radar frequencies. It is thought that these jammers may also use AESA technology. Even with a maximum load of electronic-warfare gear, the J-16 would have six of its twelve hardpoints free to carry weapons. China has three different types of anti-radiation missiles (ARM), which are designed to home in on enemy radars from afar. The CM-103 missile has a range of sixty-two miles and is probably accurate enough to hit naval and ground targets with its 176-pound warhead. China also has a indigenously developed copy of the Russian Kh-31P missile, known as the YJ-91, which has slightly longer range and also has antiship applications. Finally, there is an LD-10 ARM missile derived from the PL-12 antiaircraft missile. Of course, the J-16D could carry most of the other armaments that the basic Red Eagle fighter can carry on its underwing hardpoints. 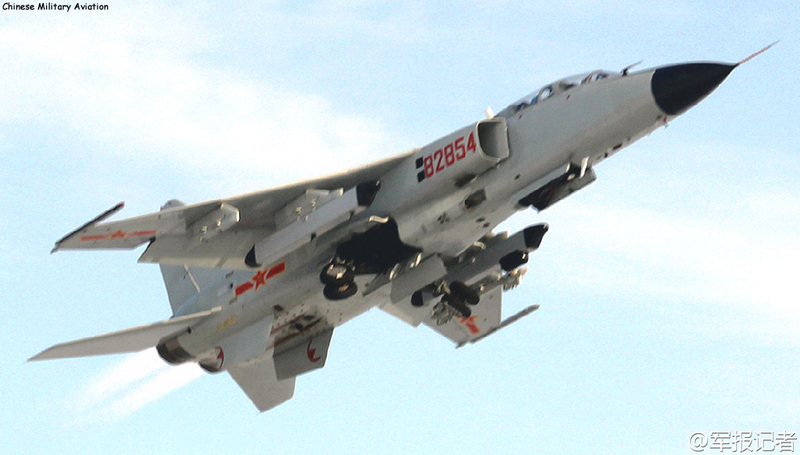 China already flies another fighter bomber with electronic warfare capabilities, the domestically designed two-seat JH-7 Flying Leopard, around 240 of which serve in the PLA Air Force and Naval Air Force. Capable of long-range operations and maximum speed of Mach 1.75, the Flying Leopard can carry about twenty thousand pounds of munitions, including anti-radar missiles. Both the base JH-7 and upgraded JH-7A have been photographed with jamming pods, which boast multiple jamming transmitters. However, the Flying Leopard lacks electronic warfare equipment integrated in the airframe, and is thus more limited as an electronic-warfare platform than a purpose-designed aircraft. China also maintains a modest fleet of larger, slower aircraft that can provide jamming support at standoff range. These include a couple dozen Y-8GX and Y-9GX transports equipped with tactical jammers and other electronic-warfare gear, and HD-6 electronic-warfare planes based on the H-6 bomber. New Xianglong “Soaring Dragon” drones may also have application as tactical jammers. After all, China is more famous for how its own missile systems serve in its antiaccess/area-denial strategy. Where might China actually confront enemy air defenses? Of course SEAD aircraft would have application in a conflict with Taiwan or, more unlikely, Japan. However, the electronic-warfare aircraft may be most oriented at countering U.S. Navy surface warships, which bristle with SM-2, SM-6 and Sea Sparrow surface-to-air missiles for shooting down both hostile aircraft and antiship missiles. These are especially potent when their firepower and sensors are coordinated by the Aegis combat system, which include vessels in the American, Japanese, South Korean and (soon) Australian navies. Beijing is not interested in foreign wars at this time. However, it does seek to alter the military balance of power in the Pacific Ocean. Aircraft like the J-16D suggest the People’s Liberation Army is interested in developing specialized aircraft that will offer China a full spectrum of air-warfare capabilities—just like those of the U.S. military.